Ain’t Misbehavin’ at the Westchester Broadway Theatre is one of the best nights I’ve had at a show in a while. The cast and the band practically radiate energy and make you want to get up there and dance with them. 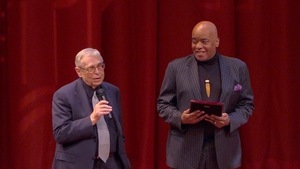 Prior to the performance, A. Curtis Farrow presented Richard Maltby, Jr, with an AUDELCO* award. Farrow was the Associate Director on the production, and Maltby, Jr was the director of both the original Broadway production, and the current production at WBT. The award honors the 40th anniversary of Ain’t Misbehavin’ celebrating the music of Thomas Wright ‘Fats’ Waller. And what a celebration it is! This cast truly brought their all every second onstage. The cast of five include Martine Allard, Ron Lucas, Tony Perry, Amy Jo Phillips and Anita Welch. Their chemistry was beautiful to watch, as they meshed perfectly together, but were each able to command the stage for their solos as well. Ron Lucas, playing Andre, really stood out, particularly in “The Viper’s Drag.” The penultimate song in the show, “Black and Blue,” is one of the more sobering songs. The cast is truly captivating in this number with their simplicity and the beauty of their perfect harmonies. 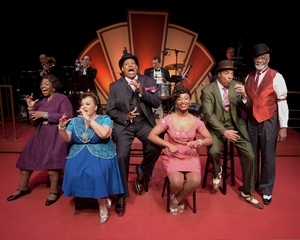 Join five performers on a journey through the timeless music of Thomas “Fats” Waller. You’ll be jumpin’ and jivin’ with memorable songs such as “Honeysuckle Rose”, “Ain’t Misbehavin", “Black and Blue”, “This Joint is Jumpin’” and “I’ve Got a Feeling I’m Falling.” One of the most popular, well-crafted revues of all time, the sometimes sassy, sometimes sultry, has moments of devastating beauty that is simply unforgettable. Your toes will tap, your shoulders will jive, your head will bob along with some of the most infectious swing America has ever created, the music of Thomas "Fats" Waller and some others who shaped the feel of the 1920s, '30s, and early '40s. This musical revue is like one big rent party or club show on stage. Enjoy the great stride music of Fats Waller with performers singing and dancing his musical tales of love, longing, and the zest for life. Starring: Martine Allard, Ron Lucas, Tony Perry, Amy Jo Phillips and Anita Welch. With: Derrick Baker and Bambi Jones. Directed by Richard Maltby Jr., the Associate Director is Curtis Farrow, the Musical Director is William Foster McDaniel. Set Design by Steve Loftus, Lighting Design by Andrew Gmoser, Sound Design by Mark Zuckerman. The Costume Designer is Keith Nielsen, the Production Stage Manager is Victor Lukas, and Properties are by Grumpy’s Props. Lisa Tiso is the Associate Producer. * The AUDELCO (Audience Development Committee, Inc.) is an organization that acknowledges and honors Black Theatre and its artists in New York City. Established and incorporated in 1973 by Vivian Robinson (1926-1996), to stimulate interest in and support of performing arts in black communities. Developing relationships with individuals, local groups, churches, and other organizations to introduce new audiences to non-profit performing arts. The annual Vivian Robinson/AUDELCO Recognition, “The VIV”Awards are the only formally established awards presented to the black theatre community.